Our Signature 3-panel trade show display has been discontinued. 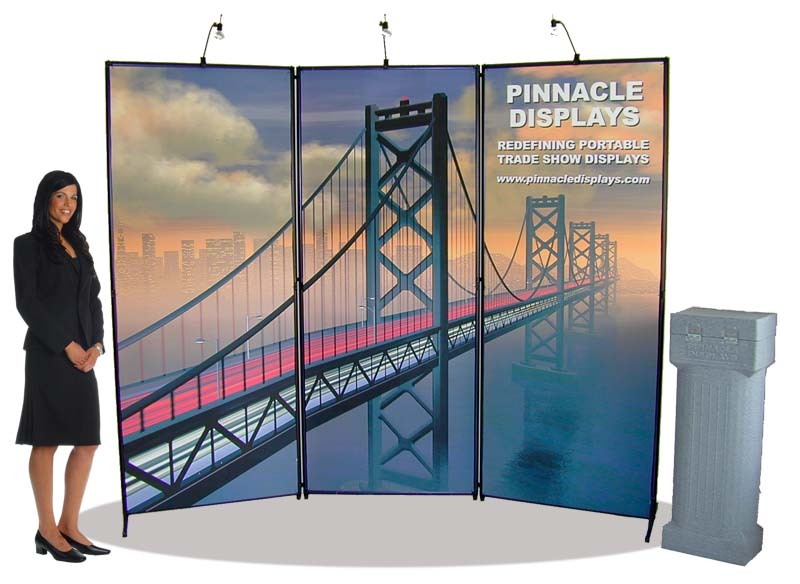 "Just a note to thank Pinnacle Displays for the outstanding service you provided in the quick production turn-around and delivery of our Signature portable three-panel trade show display system. It truly is everything your web site claims. We are very pleased with the quality and construction of the system, as well as the ease with which it can be put together and taken down. We recently traveled by air to a trade show in Colorado and had absolutely no problems checking it through standard baggage. It's a great system for anyone who desires maximum marketing impact with minimal installation requirements. We look forward to the next opportunity we'll have to work with Pinnacle Displays." CUSTOM GRAPHICS - Our Signature® trade show graphics display booth includes full-size, full color graphic exhibit panels printed from your computer design, that will help insure you make a polished and professional first impression on your prospective clients. Our graphic panels are extra-wide (25% wider than most pop-up display booth panels). Updating your display is as simple as changing your computer file and having a new panel printed. In today's competitive trade show exhibit booth environment, you should never settle for anything less than full-size trade show graphics in your trade show exhibit booth. MODULAR DESIGN - Due to it's modular design and it's unique snap-on connecting-hinges, our Signature® 3-Panel Trade Show Display can be set up as a curved or straight wall (ideal for the standard 10' by 10' tradeshow booth), or as a triangular tower/kiosk, or as three individual single-unit displays (the display comes with one set of end feet - to use all three units individually requires the purchase of two additional sets of feet). Multiple units can also be connected to make wider displays, or other shapes. Two 3-panel displays can be used to create a six sided center island in a 20' by 20' booth, or to create a six panel long (18 foot long) back wall in a 20' by 10' booth. PORTABILITY - Our Signature® trade show display is one of the most portable full-size displays on the market, and is half the weight of a typical pop-up style display booth. The entire 3-panel display packs in single rugged, compact, rotationally-molded case with wheels, and weights only 41 pounds (45 pounds with optional lights and podium cover). Our Signature trade show graphics booth display has a packed weight of about HALF the weight of most comparable displays. The shipping case can be checked as airline baggage or shipped by UPS or FedEx. EASY SET-UP AND EASY PACKING - Our Signature® trade show display sets up quickly, easily, and without any tools. One person can set up the display in less than 15 minutes. Because of the quick, easy, tool-less set up, you will not have to hire expensive union labor at the convention exhibit hall to set up your display. Repacking your display is just as easy. The three graphic panels roll up and slide into the outside of the case, and the frame then disassembles and goes into the inside of the case. Compare this to the typical fabric panel popup display booth design that can require multiple attempts to fit everything back into the case. RUGGED DURABILITY / LIFETIME FRAME WARRANTY - Our Signature® trade show graphic booth display utilizes a rugged, patented frame design to insure years of trouble-free service, and is backed by a Life-Time Warranty. FRAME - Our Signature® trade show display frame is made of aircraft-grade lightweight high-strength matte-black anodized aluminum with six spring-loaded snap-together fittings. Multiple frames connect together with rugged one-piece snap-on connector hinges, allowing frames to be used in multiple configurations. Extra wide 20 inch long black powder-coated aluminum feet attach to the bottom of the frames for ample stability. The display frame is easily and quickly set-up and taken down by one person with no tools, and is covered by a Life-Time Warranty. GRAPHIC PANELS - Our Signature® trade show display's graphics panels are printed with a 600 dpi full-color CMYK printer and then laminated to encapsulate and protect the printing. The front of the panel has a 10 mil thick matte-finish LEXAN polycarbonate over-laminate. The Lexan over-laminate is extremely durable, and the matte finish surface reduces and eliminates distracting glare and hides finger prints. The back of the panel has a opaque white backing. The panels are flexible enough to roll up and pack in the case, yet rigid enough to lay flat when unrolled and attached to our display frames. Panels are 34.5" wide (25% wider than most popup display panels) and 85.5" tall. Your proof and your panels are printed from your computer design. SHIPPING CASE - Our Signature® trade show display's shipping case is one of its best features. The case is manufactured using the rotational molding process, which produces the strongest plastic case possible. The case uses rugged, high-end hardware (spring-loaded handles, and heavy-duty lid hinges and latches), and has wheels. The case has an attractive grey granite-like finish, and can double as a podium The case can be checked as airline baggage or shipped by UPS or FedEx. CASE-to-PODIUM COVER - This black fitted cover slips over our Signature® trade show display's shipping case to convert it into a fully functional podium / counter that is approximately 16" by 11" and 42" tall. The podium cover is made out of wrinkle-resistant black polyester, and stores in the case. It literally takes only a few seconds to slip it on or off. Converting your shipping case into a podium has the additional advantage of allowing you to store your case at your exhibiting booth space, rather than being required to store it somewhere in the back of the convention hall, and then waiting for it to be brought back after the show is over so that you can pack up your display. Stand Out From The Trade Show Crowd! It's critical for your trade show marketing success to make sure your trade show graphics and your trade show booth stands out from all the other trade show booths. Full-size custom tradeshow graphics are the key to achieving this goal. Our Signature tradeshow graphic booth display features full-size, full-color, attention-grabbing display graphic panels printed straight from your creative design. 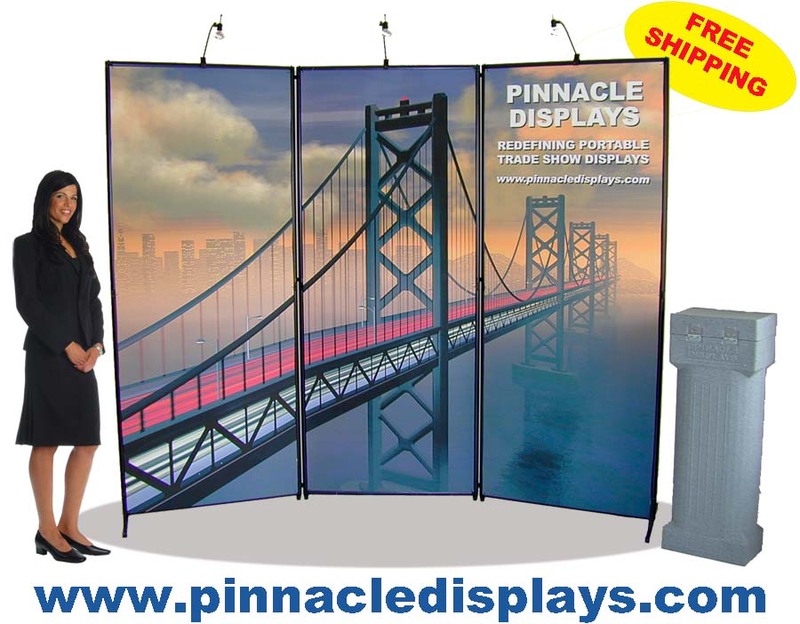 Make sure you get noticed... make sure you get a Signature trade show display for your next trade show, convention, or other marketing event. Redefining portable trade show displays and trade show booths. Signature® is a registered trademark of Pinnacle Displays, Inc.